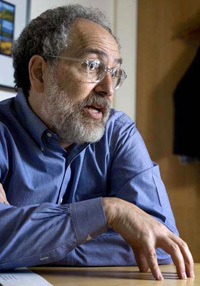 The UC Santa Cruz Social Sciences Division has named Peter R. Stein, a 1975 environmental planning graduate of College Eight, as winner of the 2011 Distinguished Social Sciences Alumni Award. Education professor emeritus Art Pearl has been selected to receive the 2011 Distinguished Social Sciences Emeriti Faculty Award. Stein and Pearl will be honored in separate events on April 29 in the Las Feliz Room of the Seymour Discovery Center at Long Marine Lab, the day before UCSC's Day by the Bay open-campus celebration. Pearl will be guest of honor at a luncheon from 11:30 a.m-1:30 p.m. A reception celebration of Stein's award is set for later that afternoon from 4-6 p.m. The distinguished emeriti award honors eminent scholars, researchers, and instructors who continue to make major contributions in their fields as emeriti faculty. Social Sciences Dean Sheldon Kamieniecki said Pearl's "record of achievement and … active engagement as an important member of the academic community merit special commendation and thanks." Pearl joined UC Santa Cruz in 1972 and retired in 1991. He was also elected to three terms on the Santa Cruz City Schools Board of Education. The distinguished alumni award recognizes Social Sciences graduates who have made extraordinary accomplishments in their careers. Stein is being honored for "his tireless, consistent, innovative, and pioneering approaches to the field of conservation planning and development." After graduation, Stein joined the Trust for Public Land in San Francisco as one of its first employees, eventually rising to senior vice president. In 1990, he joined the Lyme Timber Co., a Hanover, N.H. timber investment firm specializing in conservation partnerships. He currently serves as managing director. There he became known for innovative deals that preserve large tracts of land through partnerships that bring together timber companies, land conservancies, and state and local agencies. He's helped orchestrate the company's largest conservation transaction: a deal in the Adirondacks that combines conservation easements, working forestlands and preserved areas to protect 276,000 acres from development. Stein has also recently received the Bridge Builders Award from Partners for Livable Communities and the Pacific Forest Trust’s Forest Champion Award. UCSC alumnus Peter Pollock, colleague James Levitt, and UCSC professors Paul Niebanck and James Pepper nominated Stein. Pearl was nominated by UCSC alumnus Joseph Berney, a 1975 economics and education graduate of Cowell College, and Gary Bloom, a 1975 sociology graduate of College Eight, and the current superintendent of Santa Cruz City Schools. Berney won the Distinguished Social Sciences Alumni award in 2008. Dean Kamieniecki's Board of Councilors made the final selections for the alumni and emeriti awards.